"To conserve vital stocks, Ted Heath's Government put industry on a three-day week from 1 January 1974. There was no legislation: industry simply did as it was told in that very different period in our history. Under the Government's restrictions, a 50 m.p.h.speed limit was imposed on motorists. Television closed down at 10.30 p.m. A junior minister (subsequently a member of Margaret Thatcher's Cabinet) earned instant notoriety by advising people to clean their teeth in the dark." I love the cleaning the teeth in the dark story. Read the whole thing here. There's good stuff on The Blue Blog most days now. That wasn't true when it launched. Definitely worth adding to your favourites. “If we win, we will inherit a huge deficit and an economy in a mess. We will need to do difficult and unpopular things for the long term good of the country. I know that. I’m ready for that." "There is a big argument I want to make - about the financial crisis and the economic downturn facing the country too. It’s an argument about experience. To do difficult things for the long-term, or even to get us through the financial crisis in the long term, it’s not experience we need - it’s character and judgment. To rebuild our economy, it’s not more of the same we need, but change. "Experience is the argument of the incumbent over the ages. Experience is what they always say when they try to stop change." The BBC has analysed the 400,000 words from the publicly-available speeches that David Cameron has made since he became leader in December 2005. Read the analysis here but most notable is the consistency of his references to the NHS (and not to immigration) and the fact that Iain Duncan Smith gets more name checks than any other member of his team - a tribute to the importance of IDS' social justice agenda. The Tories maintain their large opinion poll lead. The month began with a Conservative lead of 19.0% in the ConHome poll of polls. It ended with a lead of 18.6%. Boris Johnson enjoyed lots of attention. He endorsed Barack Obama, celebrated 100 days as Mayor, lost another Deputy Mayor, received the Olympic flag from Beijing, claimed the Brits had invented ping-pong, unveiled a climate change strategy for London and fanned speculation that he wanted to be PM. A new narrative is clearly underway: Boris V Cameron is going to be the media's device to undermine DC. Michael Gove attacked the hedonism of lads' magazines like Zoo and Nuts. This socially-responsible Conservatism was followed up by Iain Duncan Smith and Ed Vaizey who suggested that Batman, The Dark Knight should have carried a stricter cinema classification and Andrew Lansley launching an inquiry into obesity. A ConservativeHome survey found that Tory members were much less laissez-faire on these 'nudging' initiatives than those who leave comments on blogs. David Cameron took a tough line against Russia over Georgia. A telephone call with John McCain helped produce a very assertive Conservative position - overturning an even-handed immediate reaction from a very cautious William Hague. Mr Cameron's active stance contrasted hugely with the absence from the world stage of the feuding Brown and Miliband. David Cameron's tour of northern marginals was overshadowed by a Policy Exchange report that the media reported as a call to 'abandon the north'. The report was unfairly reported but it highlighted the dangerous strategy that had seen PX get too close to Team Cameron. John Major won a lot of credit for funding the revival of British athletics. ConHome was first to recognise that Britain's last Tory PM was due a measure of rehabilitation. Lord (Sandy) Bruce-Lockhart died. One of the gentlemen on Conservative politics - a leader in local government and of compassionate conservatism - lost his battle with cancer. Tributes poured in and in. Caroline Spelman lost the confidence of Conservative Party members. A ConservativeHome survey found more members dissatisfied with the Tory Chairman than satisfied. An unfair briefing campaign against Eric Pickles suggested that Team Cameron may be thinking of Chris Grayling as her likelier successor. George Osborne claimed that the Conservatives are now the party of fairness. Mr Osborne is formally the Shadow Chancellor but he most enjoys his role as the strategic brain behind Project Cameron. His 'fairness' speech sought to knock Labour off its most sacred turf. The biggest story came at the very end of the month when Alistair Darling spoke of the worst economic crisis for sixty years. Yes, sixty years! Watch him here. Charlie Elphicke decided that Darling must go for unforgivably talking the UK economy down. Is Tory economic policy up to the increasing challenge of restoring the competitiveness of UK plc? ConHome surveyed the good, the bad and the ugly of the frontbench's thinking. Daniel Finkelstein pens a provocative piece today: "The British voter never gets it wrong. At every election in the past 80 years the right party has won." Our proposition for the day is a little more modest: John Major is going to be judged a lot more kindly by history than by the press of his time. Sandwiched between one of Britain's greatest-ever Prime Ministers and by one of the world's most formidable politicians, John Major had to withstand some challenging comparisons. But Gordon Brown is probably coming to his rescue. Rob Wilson MP has already noted that comparisons with John Major flatter the current PM. But Gordon Brown's greatest gift to Sir John may yet to arrive. The consensus is that John Major led the Tories to one of the worst election results in British history. Undoubtedly true by any historical comparison but what if Labour loses comparably badly in 2010? John Major's defeat will look less unusual and more a product of volatility in the electorate and of a mood for change that sets in after a long period of one party being in power. In time historians may remember John Major not so much for 1997 but for the strengths and weaknesses of his time in power. The downs were Black Wednesday and his government's awful role in the break up of Yugoslavia. The ups were Michael Howard's successes on crime and the golden economic legacy that Brown squandered. John Major: "The threat to liberty is graver than terrorism"
Complicity in rendition: "We now know that, despite repeated denials, our Government was complicit in rendition, or - to put it in plain terms - the transfer of suspects out of civilised jurisdiction to a place where they could be held without charge for a lengthy period. Although the intention was presumably to garner information, such action is hardly in the spirit of the nation that gave the world Magna Carta, or the Parliament that gave it habeas corpus." 42 days: "The Government has introduced measures to protect against terrorism. These go beyond anything contemplated when Britain faced far more regular - and no less violent - assaults from the IRA. The justification of these has sometimes come close to scaremongering. After terrorist attacks on London, Parliament doubled the time that suspects could be held without charge from 14 days to 28 days. Probably, that was justified. But soon Parliament will be asked to increase detention without charge to 42 days... There is no proof that an extended period of 42 days would have prevented past atrocities. There is no evidence it will prevent future atrocities. No example has yet been given of why the police need more than 28 days to frame a charge." ID cards: "They were to be voluntary. Now it is clear that they will be compulsory. Yet the Government has admitted that such cards would not have stopped the London bombers. Nor will they cut illegal immigration, since asylum-seekers have been obliged to carry ID cards for nearly eight years. Nor will they have any real impact on benefits fraud, as this is typically caused by misrepresentation of financial resources rather than by identity." Recording DNA: "Under present legislation, DNA can be retained permanently for even minor misdemeanours, such as being drunk. A total of more than four million samples are already on the UK database - far more than in any other country. This includes tens of thousands of children, and a disproportionate number of black men. If this is accepted, it will one day go farther. This cannot be right: for me, it is all uncomfortably authoritarian." Interviewed on Andrew Marr this morning, former Prime Minister John Major warned against further taxpayer funding of political parties. Politicians are already remote enough from the grassroots, he warned, and any further taxpayer funding would risk diminishing the connections that the party elites had with ordinary voters. The loss to Britain of Gordon Brown's mis-timed gold sales is greater than the losses inflicted by Black Wednesday, he said. In addition it will be "quite likely" that the mishandling of Northern Rock will also cost more than Black Wednesday. In the 1980s and 1990s there were individual misbehaviours but there was not a culture of sleaze. New Labour's behaviour in the 1990s, he said, in trying to paint the whole Conservative Party as tainted was "almost McCarthy-ite". People would now laugh at Labour if they repeated their promise to be "whiter than white". He said that Labour would find it difficult to attack Team Cameron as inexperienced because of the inexperienced nature of its own team. When he was Prime Minister there were plenty of people of PM calibre - Ken Clarke, Michael Heseltine, Douglas Hurd, Malcolm Rifkind - only Jack Straw is experienced enough to take over today. We went into Iraq on a false premise. Saddam has gone but everything else looks pretty "bleak". Unemployment is 50%. Death rates remain very high. The whole episode cannot be looked upon with pride. PS Also on Marr this morning was Rory Bremner. His amusing review of the year including impersonations of Gordon Brown, Ming Campbell and George W Bush but he didn't attempt a David Cameron voice. He actually performed a PMQs-style exchange on the EU Treaty between Gordon Brown and William Hague. 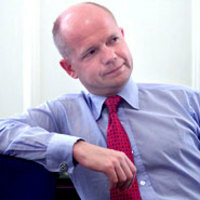 For the perfect William Hague impersonation ConservativeHome recommends Conor Burns or Jonathan Isaby! The dramatic political effect of Shadow Chancellor George Osborne's inheritance tax announcement has been recognised today by The Spectator's annual parliamentary awards. Mr Osborne has been made politician of the year for what Fraser Nelson, the magazine's Political Editor, believes was "the single most effective policy ever announced by the Conservatives in Opposition". 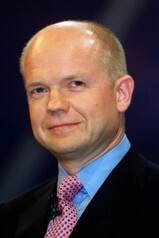 William Hague is also recognised. 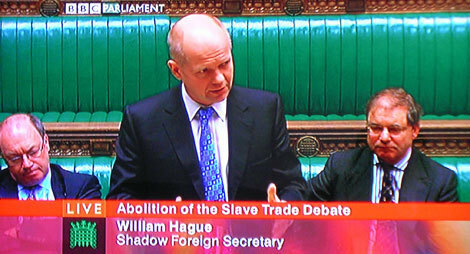 His speech on the anniversary of the abolition of slavery wins him the speech of the year award. BritainAndAmerica covered it at the time. It was a great speech. Baroness Thatcher is Peer of the Year. The Spectator have recognised the year in which everyone wanted to be seen with the Iron Lady... most notably Gordon Brown but also Rudy Giuliani. Her impact on Britain still recognised as profound. 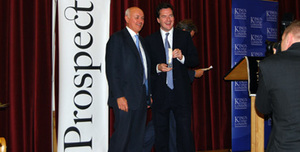 Iain Duncan Smith's remarkable political rehabilitation has also been recognised by The Spectator. The former Tory leader is the magazine's Campaigner of the year for his success at putting social justice at the heart of the public debate. I'm in Washington DC with Philippa Stroud and Cameron Watt of the Centre for Social Justice for a conference on poverty-fighting. We'll raise a glass of bubbly to Iain later. The three leaders the Party had after Major and before Cameron were the first leaders of the Party not to make it to Prime Minister since Austen Chamberlain in the 1920s. William Hague got something of a hospital pass but impressed at the Despatch Box and tried to make the best of a bad situation. Iain Duncan-Smith struggled with his parliamentary colleagues but set in motion a policy agenda that is now central to the Party. Michael Howard professionalised the Party somewhat but failed to persuade the public at the election. What do you think their relative merits were? Previous debates: Labour or the LibDems - who is worst? and Ousting Maggie or Black Wednesday - Which event hurt the Tories most? 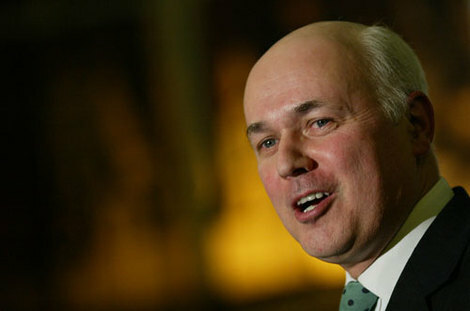 A tear or two appeared in Iain Duncan Smith's eye this afternoon during a sustained standing ovation. He had addressed the Conference without notes on the cause that has come to define his politics - the mending of Britain's broken society. I have to say I was a bit tearful, too, as I stood watching at the back. Earlier today I'd spent over an hour with Iain and Betsy and he then only had a sketchy idea of what he was going to say. He spoke from the heart this afternoon on a subject he has come to understand so well. Don't just think it was me - Ben Brogan describes Conference's response as "huge". 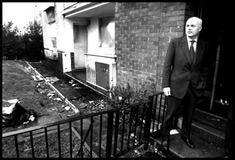 After describing the nature of Britain's broken society he recommended support for marriage, ending the couple penalty, pioneer schools inspired by the USA's Charter model, premium pay for inner city headteachers, a massive increase in drug rehab, encouragement of credit unions and support for a more independent voluntary sector. He ended by saying that the Conservative Party couldn't be a truly patriotic party if it didn't love all of Britain's people. I am so proud of the Centre for Social Justice and all that it has achieved under Philippa Stroud and Cameron Watt. Even in the BC period (Before Coulson), David Cameron's enthusiasm for this social justice project made the election of a Conservative government worthwhile. With this week's announcements on tax its doubly worthwhile. I hope David Cameron can capture some of IDS' passion for his speech tomorrow. "It is clear after the last three elections that I think what David Cameron is doing is right, that we have to recapture the centre ground. And he’s set about it very energetically, very effectively. [...] He is very good. He is, all round, the most accomplished politician of all of us who’ve led the party in recent times... I think since Thatcher. But he’s also got real tenacity, which I think people have seen in recent weeks. The media has had a big downer on him this summer, but that hasn’t ruffled him. He has got the steel to come out the other side. I have huge respect for the man, actually. And I wouldn’t be doing it otherwise." "So, as we recall - and give thanks for - the liberation of our islands, let us also recall the many battlefronts where British forces are engaged today. There are in a sense no final victories, for the struggle against evil in the world is never ending. Tyranny and violence wear many masks. Yet from victory in the Falklands we can all today draw hope and strength. Fortune does, in the end, favour the brave. And it is Britain's good fortune that none are braver than our armed forces." "The world needs a confident, powerful Britain that stands as a warrior nation in the defense of freedom and Western civilization. To all intents and purposes, Britain and America today are at war globally against a vicious enemy and ideology that seeks their destruction." He has had a remarkable transformation from failed anorak to immensely popular politician and speaker (his latest Conservative Member's Panel rating will be revealed on Monday). "There is a completely different atmosphere in politics when you have a good chance of winning". Hague qualifies his "disproportionate" statement on the Lebanon crisis, saying: "our concern about Israeli actions has been those that appear to have been only tenuously or unrelated to Hezbollah". In response to the firestorm caused by the statement - with strong disapproval from both Party donors and the Conservative Friends of Israel he says: "We’re not going to frame foreign policy on the grounds of who’s going to get upset. If we tried to do that, we’d never be able to say anything at all". Forcefully denies Cameron knows little about foreign policy, and says they carefully agree on everything together. Being a successful leader of the opposition "requires the right sort of food, sleep and exercise, which needs rigorous policing". He advises Cameron to eat vegetable soup. Do you miss being leader? "I’ve got that all out of my system. Totally...I’m a fan of DC and I enjoy working with him, and I’ve only come back to help him win the next election. I don’t ever want to be leader again myself. I could happily write books instead. I enjoy that at least as much as politics." Some party insiders claim he suffered a near nervous breakdown in the aftermath of his exit. He says that his resignation "taught him that there’s more to life than politics". On having more women candidates, he wishes he has been more radical when he was leader but believes the party is now "very willing to accept change". Ahead of travelling to India with George Osborne and Liam Fox, Hague advocates a reappraisal of British foreign policy (to that of the Cavaliers? ): "It has been too Eurocentric in the past 20 years. A much higher level of engagement with the Pacific and Indian Ocean nations is important.". He believes that military force and espousal of democracy are not enough to defeat Islamic terrorism. “A great deal of my experience and knowledge is relevent (sic) to what they do. There’s a growing need for intelligence gathering in this age of globalisation, with people having to deal with parts of the world which they may not be familiar with." Mr Howard is expected to earn a six-figure sum and may announce further directorships in the coming fortnight. Zoo makes Loaded look upmarket and I am not a regular reader but I did part with £1.30 this morning after I heard that Margaret Thatcher had bested Carol Vorderman in a readers' vote. The most shocking finding was that some readers of Zoo must watch Newsnight as they made Kirsty Wark runner up in the best PM stakes. For those interested... Jade Goody was the readers' favourite to 'stop from ever speaking again'; Jennifer Anniston was the ideal wife; and Kate Moss topped the 'get a bit fatter' vote (Charlotte Church won 'see get thinner'). Should Prime Ministers be limited to eight years in office? "I think we have seen examples of politicians carrying on too long. I personally believe - although I'm not quite sure how you enshrine it - that the American system of somebody serving only eight years is very sound. If you look historically at prime ministers who have served beyond eight years, it has usually been downhill once the eight-year mark has been passed. So I think as a self-denying ordinance, leaving after eight years is a very smart piece of politics." Mr Major may be right that most Prime Ministers and Presidents would be best advised to go after eight or so years but, as he hints, it is difficult to legislate for term limits. It is easy for politicians to become lame ducks when everyone knows that they are 'on the way out'. Tony Blair has lost much of his authority because the whole of his government is now looking to his successor for future direction and patronage. Surely it is for voters to decide whether a political leader has run out of steam or not?